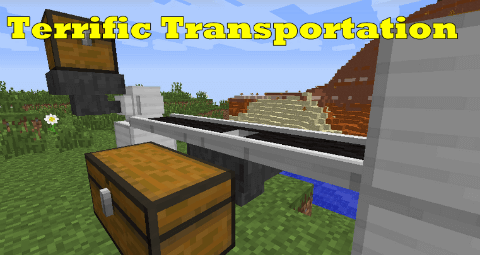 Terrific Transportation Mod started out as a ModJam4 project. If you don’t know what ModJam are, it is basically a modding competition where a ton of modders have 92 hours to create a mod publish it and release it. After that the community votes on each others mods, the winners usually get some awesome rewards. If you have played modded Minecraft before you have probably seen conveyor tracks from other mods like MFR or Extra Utility’s. The problem I find with these mods is that the conveyor belt systems are very limited (no offense to the authors (I respect em so much)). My vision was and still is to create a conveyor belt network capable of replacing the “piping” system overflowing all mod packs. But how could I do that? First we made the conveyors “smart”. By smart I mean the conveyors know whats around them. If there is a inventory in front, the model and the codes changes up, to prepare the conveyor to export or import from that inventory. No longer do you have to craft a import or export conveyor and the place it. The conveyor AI already know that. Another example is if there is a hopper underneath the conveyor. The conveyor updates its model to create a square hole in itself so the items can fall through and into the hopper underneath. Basically the conveyors knows that is around them and knows how to interact with the environments. To get a even more advanced and better conveyor belt system, we wanted the conveyors to be modular. The consent of the modules are simple. Each conveyor can store up to 4 modular each. The modules are graphically displayed as SD cards. This feature is to give the player a total configurable conveyor network. If he wants a fast conveyor network to transport things fast, throw in 4 speed modules. Other modules like the light module that makes the conveyor emit light is a alternative. Another module centers the items to the middle of the conveyor to make it more stable and keeps the entity’s a bit easier on the track. The modules are basically giving you the freedom to configure your network for your intended use. The conveyors are really flexible, they can turn, climb upwards and downwards and make crossroads. That’s something other conveyor mods aren’t capable of. They are also coded with a nice looking 3D model that’s changing shape for different situations. Here is the cool part! The conveyor can transport any entity around your Minecraft world. Everything from mine carts, to animals, mobs, ignited TNT or items. Every entity in the game.